What Happened to My Bike?!! 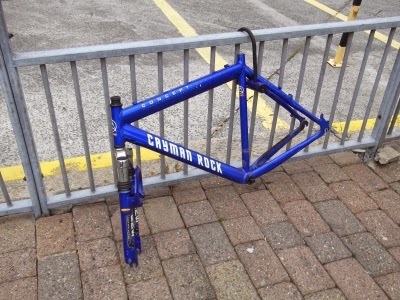 One day a cyclist chained their beloved bike to the rails outside Plymouth bus station. For some reason they didn’t come back to claim it. If you have read my post about a car becoming obscured by parking tickets near the office you might draw the same conclusions here, that the owner might be scratching his head wondering where he left it, in a coma or dead. Whatever his condition he probably won’t want it back now anyway. In an effort to reduce the weight of the bike and improve its performance the local populace has been pimping it. Over a period of a few days they have removed all the unnecessary and weighty items like: tyres, inner tubes, wheels, gears, saddle, seat post, handlebars, stem, pedals, cranks, brakes and even cables. All that remains, without the enterprise of removing the lock, is the forks. I wonder how long they will last? Next Post Riding a Bike is Cheaper Than This! I saw a similar bike recently. Totally stripped bare and I wondered, how on earth it got so detached of all it’s components. The mind boggles. If this was a case of multiple thieves as opposed to the same person continuously returning, what does this tell us about society. I’m going to Chain one of my old bikes to a local railing and purely in the interest of a social study, watch what happens. John, I recall watching a documentary a few years ago where they abandoned a car in a layby on a country road and set up a secret camera to see what happened. Over the course of the next few weeks the car was stripped down by various visitors until just the husk remained. A bit like watching one of those time lapse videos of insects and other small beasties devouring the corpse of dead rabbit or similar leaving only the bones.